X-rays are waves of electromagnetic energy which form part of the electromagnetic spectrum, along with other waveforms such as radio waves, microwaves, infrared waves, UV waves and gamma waves. Human eyes are sensitive to the particular wavelength of visible light, but not to the shorter wavelength of higher energy X-ray waves. X-rays are approximately 1000 times shorter than the wavelength of light, and are a highly penetrating form of radiation which can pass through many materials that are otherwise opaque – X-rays can even expose photographic film that is enclosed where visible light is unable to get to it. X rays will pass uninterrupted through low-density substances, whereas higher-density materials will reflect or absorb the X rays because there is less space between the atoms for the waves to pass through. X-rays were discovered in 1895 by the German scientist, Wilhelm Roentgen, while he was studying the production of cathode rays in a vacuum tube. 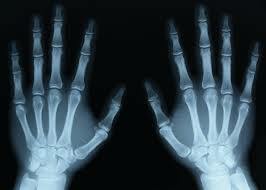 A week later, he took a famous X-ray photograph of his wife’s hand which clearly showed her wedding ring and her bones. This photograph electrified the general public and aroused great scientific interest in the new form of radiation. Roentgen called it “X” to indicate it was an unknown type of radiation. Man-made X-rays are produced by a piece of equipment called an X-ray Tube. X-ray tubes are precision designed and manufactured and have evolved tremendously over the past 100 years. They are often the most expensive component in an X-ray system. Inside every X-ray tube are two components: the cathode and a metal target called the anode – that both sit inside a vacuum. X-ray production involves accelerating electrons in order to collide with the metal target. When electrons from the cathode strike the anode, two types of energy are generated: heat and radiation (X-rays). In baggage screening, as the x-rays pass through a suitcase, for example, and are then attenuated (weakened) by the different densities of objects inside the bag that they encounter. A magnified “shadow” of the suitcase and contents is then shown on the X-ray machine’s computer monitor. Like a light bulb, an x-ray tube requires replacement every few years, depending on use. The two commonest commercial applications of x-ray scanning technology are medical imaging and security scanning of baggage and cargo. X-ray has particular advantages over other security technologies, such as metal detectors, as it can NOT ONLY help detect conventional metallic weapons like guns and knives, but it an also help detect hi-tech plastic, composite and ceramic weapons, explosives, illegal drugs and other contraband. Not only can these objects be detected with X-ray, but their exact size, shape, and location can also be seen.